For something a little different today, I wanted to talk about laundry and how to wash white striped clothes. You see, laundry is something I have come to put more thought in to in recent years. And no, it’s not because I’m a glutton for punishment, but because since having kids I do so much more of it. So much more. To the point that, whether I like it or not, laundry takes up more of my day and more of my brain than ever before. Take whites for example. Prior to having children I just bunged everything into the machine and hoped for the best. I didn’t separate loads of washing by colour. I hardly owned any white clothing, so I never felt that there was any point doing separate loads because I would never have a full load of whites that needed washing at any one time. So the odd rogue white item that managed to sneak it’s way into my wardrobe got washed with the coloured stuff. What can I say? I liked to live dangerously. Since having kids it’s a completely different story. They have so many white items of clothing, which I can never understand. Kids are surely the muckiest creatures known to man, and white is like a magnet to all things dirt and food and poo. All of which kids are masters at. Yes manufacturers insist on making kids clothes, and especially baby clothes, white. With more white laundry to deal with than ever before, I realised my old dangerous ways wouldn’t cut it. I wanted to to prolong the lifespan of our clothes as long as possible because a) money and b) the environment. Which meant vowing to always wash whites with whites, and darks with darks. Which sounds simple enough, but, as with anything that sounds too simple there are always sticking points that unexpectedly rear their heads. 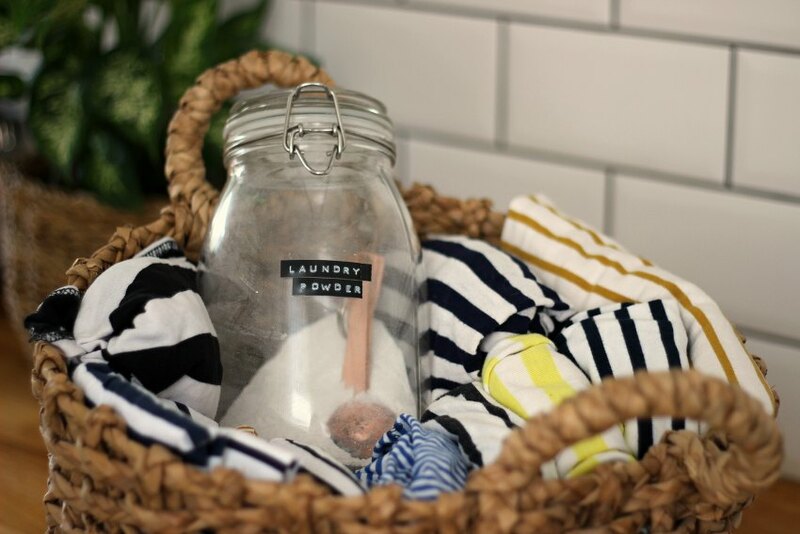 As a family of stripe lovers (and The White Stripe lovers) one of the earliest problems that cropped up was the conundrum of how to wash white striped clothes to keep them looking good for as long as possible. The labels on white striped clothes always helpfully say “wash with similar colours“. To which I always found myself shouting at the label “which similar sodding colour“?! If it’s a black and white striped top, the top is 50% white and 50% black – so which should it be in with? The white clothes or the dark clothes? Some assistance would be useful. 1) Dark loads are ok for washing stripes in if you are washing clothes that have been washed a few times before. However I wouldn’t wash white striped clothing in a dark load that contains a new pair of indigo or black jeans, or a new item of dark clothing in it, as dye tends to run from these items in the first few washes, and trust me, it will ruin your striped clothes. 2) Coloured loads are also ok for washing stripes in, but I wouldn’t wash stripes in a load that contains a new item of red clothing, as red is the worst of all dyes. It will run and ruin white striped clothes in the blink of an eye. Aka, the worst of the striped clothes. Washing white and red striped clothes is headache inducing because red dye is so temperamental. I would only ever wash white and red striped clothing in with other coloured clothing, and never with white clothing, on the coldest wash your washing machine will muster. About 3 or 4 days after my first daughter was born, and a mountain of white laundry had piled up for the first time ever, I washed a load of white washing that contained a white baby-gro that had a tiny and completely innocuous looking red trim on it. I looked at the red trim as I bundled the washing in to the machine, and thought, “ahh, what’s the worst that could happen“?, and then ran a 30°C cycle. Well, my friend, that tiny and innocuous looking red trim ran over everything in the machine, even on a low temperature wash. At least if the red dye had ran in a coloured wash it wouldn’t have had much effect, save for the white baby gro. But in a white wash? Everything came out the washing machine sporting a pink tinge, and all I could do was be grateful that I had spawned a girl. Cold water is definitely the way to go. Trust me on this. Wash white with yellow or grey stripes in with your whites, on a 30°C wash. I’ve never had a problem with these colours before – they are my favourite of the stripes! 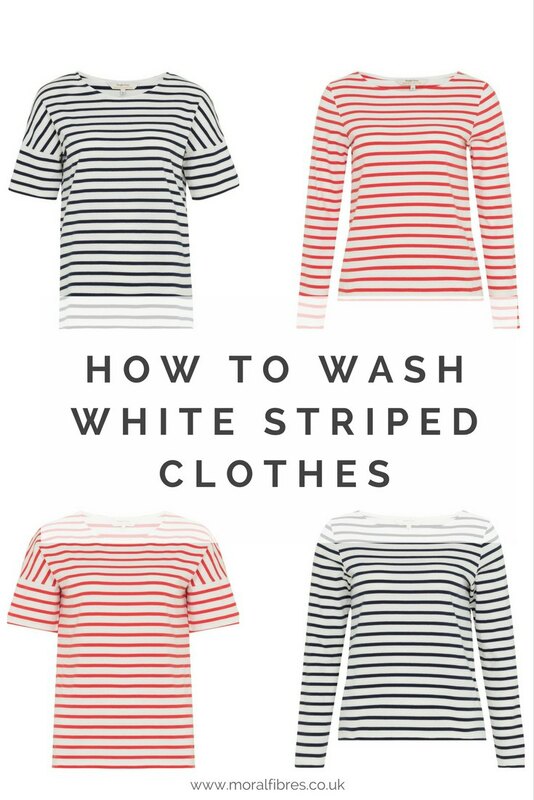 So there we have it – I hope I have solved the how to wash white striped clothes puzzle! I hope this helps you go forth and wash your white striped clothes with confidence! Striped clothes images c/o People Tree*. I have just washed a navy blue and white striped blouse in a cold water wash, but the blue has bled into the white. Is there anything you can recommend I can do to fix it or is it ruined.